Are millennials getting ready to leave big cities in droves? Some experts in demographics, economics, and real estate have predicted the millennial exodus from vast urban areas has already begun. If true, the question remains: where will they go? Some may head to the suburbs as their parents and grandparents did before them, but many will look for a different lifestyle, one that combines the advantages of suburban living with features of city life. 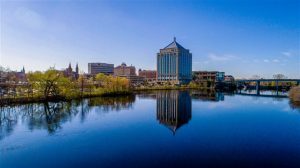 Some smaller metro areas, like Wausau, Wisconsin, they have the blend of economic opportunity, urban elements, affordability and lifestyle that will attract millennials. One strategy Wausau has focused on specifically is diversifying housing product. The City funded local architects to design an urban rowhouse — a housing style which did not previously exist. For over a decade, leaders proactively assembled parcels for new riverfront apartments and continually worked with developers to seek tax credits which could be applied to renovating historic properties into unique multifamily offerings. Recognized as a leader in economic development homesteading, Wausau’s Live It Up program is a partnership between local employers and the city to provide employees with a no-interest down payment assistance loan for the purchase of a home. In the last two years, the program has allocated more than $200,000 in no-interest loans to local employees. Millennials who came of age in urban environments have a strong affinity for multifunctional spaces and are drawn to communities that are a walkable mix of business, retail, industry and residential. While the specific physical space needs may change, their own strong sense of identity makes them inclined to seek a region that has its own established sense of self.